You see I’ve been through the desert on a horse with no name. It felt good to be out of the rain. Wal-Mart, you have failed me. At this point in time, I should be reviewing the “Adventures in the Crystal Empire” DVD, but the closest Wal-Mart decided not to stock that one, so I had to order it online. Meanwhile, they managed to put out the “Pinkie Pie Party” DVD, but in such small numbers that it sold out instantly. I missed a copy. Once again, you see what I have to work with here? So, I’m stuck reviewing this older DVD which I had to drive hundreds of miles to get a copy of. No really, I drove to a Barnes and Noble hundreds of miles away to obtain my copy. Well, I didn’t drive all that way to just buy a My Little Pony DVD. I mean, I was headed that way anyway, and just stopped in at the Barnes and Noble and found a copy. My point is, I may be reviewing the old DVD (which include two episodes I’ve, technically, already reviewed), but I had to work to be able to do it. Luckily, season 3 ended yesterday, so there’s some timeliness. Besides, how else can I go on the record about the “Spock’s Brain” of bronydom, reveal my opinions about The-Pony-Who-Dare-Not-Speak-Her-Name and review an episode of Pound Puppies, which no one else bothered to do? This DVD contains the two linked episodes that opened the show way back in 2010, another season one episode and two season two episodes. The three standalone episodes are vaguely linked by the train of the DVD’s title. Two of the episodes also feature Western style settings. Way back in May of last year, I explained how these first two episodes used tried and true screenwriting techniques to make us like the main characters. However, it takes more than likeable characters to pull off a successful dark-and-gritty My Little Pony reboot. And, okay, Friendship is Magic is not exactly grimdark [except in certain fan spoofs], and while it has been praised, both by me and others, for its lack of cynicism, it does use the audience’s cynicism against themselves. The genius of Twilight Sparkle as the protagonist is that, for this entire first episode, she pretty much finds everything she meets to be, well, kind of stupid. She opens the episode ignoring invitations to act like a stereotypical pony. As each of the other main characters are introduced, she reacts to them with open sarcasm, even hostility. This is the exact same mindset of just about any viewer who is not a girl under the age of ten - and probably even some of those. Girls mature faster, after all. Via a cynical protagonist, we are able to take this first episode, not as a straight example of My Little Pony, but as a parody of it. As the story progresses, the episode gets less and less parodic, until the climax, when the villain literally says to Twilight, “You’re kidding, right?” Nope. At this point in the episode, Twilight believes that friendship is magic, darnit! She’s gone from a hardnosed cynic to true believer. Judging from the show’s response, a good percentage of the previously cynical audience has made the turn with her. Pretty neat trick, right there. Let’s come back to Earth a minute, as the next episode on the queue is pretty bad. Applejack, along with the rest of the cast, is delivering an apple tree named Bloomberg to a pony town in the Equestrian Wild West, when it is stolen by a gang of buffalo. Apparently, the pony settlers have planted their apple trees on the buffalo’s stampeding ground. Whoops. Pinkie Pie tries to sing the two groups a song to reconcile their differences, and the episode gets some bonus points for acknowledging there are some problems you can’t solve with a song, before throwing that out the window by solving it with friggin’ apple pie. At least Pinkie’s song was her usual inspired lunacy. Newcomers displacing natives has been around forever, and it’s not a uniquely American, or even, for that matter, human, phenomenon. Let me be clear; I’m not saying it’s right; I’m just saying it’s a problem that you can’t solve with apple pie. There are just some topics that maybe shouldn’t be interpreted via the medium of glorified horse figurine commercial, and Manifest Destiny is one of those topics. It’s an ugly topic to begin with, and even attempting to solve it in 22 minutes is insulting, never mind with something as inane as pie. Kind of sad really, as the opening scenes and dialogue are pretty cute (though, while I’m complaining, I will also add that the buffalo girl looks stupid). Now on to the only episode on the disc that I didn’t struggle to not write some kind of overlong essay about. That’s not to say it’s a bad episode; au contrair, it wins the “pick of the litter” award for the non-two parter episodes on this DVD. And that’s not say it’s an uninteresting episode, either. There isn’t really an episode in the show’s run comparable to this one. It’s actually the My Little Pony Christmas episode, though certain aspects of the holiday are notably absent. No, not Jesus (we are spared even a metaphorical Pony Jesus), but surprisingly, there isn’t even a Pony Santa Claus. The episode delves into Equestria history; it becomes almost Tolkein-esque high fantasy. Okay, more The Hobbit than The Lord of the Rings; this is also a really funny episode. The different “races” are paired, and they each break down into great funny man/straight man pairs, though the Earth ponies do it best. What is it with this series and terrible Western themed episodes? This is the worst episode of season two, and, no, it’s not poor Derpy’s fault. This is the episode where fan-favorite, fan-named “background” pony Derpy both speaks and is spoken to. Unfortunately, Derpy is kind of a klutz, cross-eyed, and that word, “derpy,” is a synonym for stupid. So, the show got complaints that she was a parody of the “mentally handicapped,” the episode was edited in reruns (the DVD features the “too hot for TV” original version), and now Hasbro is basically unable to merchandise one of its most popular characters. This is why you don’t let 4chan write your toy commercials, guys. Though I like Derpy, and find the whole controversy to be political correctness run amok to almost Speedy Gonzalez levels, she does illustrate the problem with the episode – and no, it isn’t shoddy character work. When not complaining about Derpy’s treatment, fans like to complain about Applejack’s treatment in this episode; she acts out of character. In point of fact, she does, though that’s kind of the point of the episode. Besides, her friends are also out of character. In season one, they allowed themselves to be magical guinea pigs to watch Rainbow Dash compete in a flying contest, but screw A.J.’s rodeo. We wouldn’t notice these things if the episode was more entertaining; fans were so pumped to see Derpy front and center they forgot to notice she doesn’t really do anything. The punchline for Derpy finally appearing? She falls down, and I’ve discussed that punchline before. There are some great setups for gags in this episode, but precious little pay-off. It’s just not a very good episode. 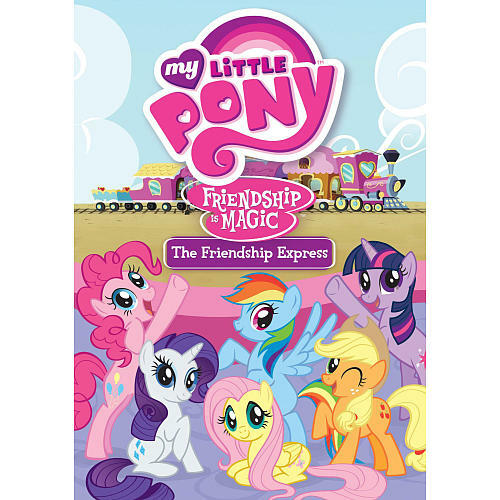 The DVD features some kid-friendly extras; there’s a series of “meet the ponies” short bits, though Rainbow Dash is inexplicably left out. I guess she was too cool. There’s also a sing along for an extended version of the opening theme (what is it with this DVD and “uncut” versions of things?). Let’s take a moment to note one of the, well, it’s not exactly unsung, being a song, but underappreciated marketing jingles of the last half-century. If you grew up in the 80s or 90s, you knew that “My little pony, my little pony!” opening bit by heart from various toy commercials, whether you liked it or not. There are variations, but it never really changes. The DVD also contains the first episode of the newest iteration of the Pound Puppies, a merchandise-driven funny animal cartoon similar in nature to My Little Pony, but minus the incredible overnight sensation status. The episode featured is also the debut episode for that series; on comparing the first episodes of both shows, it becomes more obvious why one gained a cult following despite being about a purple unicorn, and the other … exists, mostly. The characters are fine, the animation is fine, and the gags are alright, but it lacks the character-defining moments and strong protagonist of My Little Pony’s. We’re told the Pound Puppies are great, not shown. 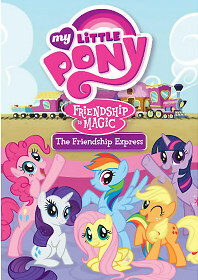 The whole “brony” thing may be a fad, but it didn’t just happen to My Little Pony: Friendship is Magic arbitrarily. Is it the best show on the air? Probably not. But when you compare it to other shows of a similar type, you realize it is the best show of its type on air right now. It’s not like this is the dark ages of TV animation, either – yet it took off like it was. This illustrates the problem with DVDs. It's five episodes which aren't even all from the same season or in order. It probably costs a fair amount too. If they actually bothered they could fit at least half a season on a single disc, without making it so people will have redundant copies of the same episodes. And then they wonder why piracy is so appealing. Just so you know, its only the first 7 episodes of Pound Puppies that have rough, rigid, animation. Pound Puppies has great characters, sharp humor, a TERRIFIC voice cast, and sweet, touching story-lines. I will always stand by that. Niblet from Pound Puppies is just as funny as Pinkie Pie. Again, episode 8 marked a noticeable (improved) change in the animation style, the animation is now fluid and clean, and done by the same studio that animates My Little Pony. Internet talk is not everything. From what I understand, Pound Puppies has been doing well for the Hub, there are a couple of Pound Puppies DVDs that have been released, and there are also some toys based on the show. Season 3 premieres later this year. Meanwhile, seasons 1 and 2 are available on Netflix streaming.